I see you came here to know more about me. Well have a seat and we can talk now my name is Liu Andrew Woods, I am 16 years old. When I was younger, me and my younger brother Jeffrey Alan Woods, were very close till one day our dad got a promotion at work so we had to move to a new neighborhood that changed our lives. Jeffrey became more quiet and more distance yet I always stayed by his side even though our parents sometimes argue. But on the first day of school, we were heading to the bus stop waiting these three kids Randy, Keith and Troy came up to us saying that new people have to pay a toll to ride the bus. So they stole my wallet out of my pocket. Then I saw Jeff beating them up. My eyes were widen. After I grabbed my wallet we ran back to our house hearing the police coming as soon as we got to the house. After the police got to the house, I didn’t want my younger brother to go Juvie so I told the police that “it was me” and got into the car even though I was hearing Jeffrey wanting me to tell the police that it was him. I just wanted to protect him cause that’s what older brothers do anyway. After I was released from Juvie, I went to the hospital with my parents to see Jeffrey again. When I saw that his face and hair had changed, my eyes widen. After we got home he started to act different he wasn’t normal anymore. There was something in his eyes I couldn’t tell. So that night I sleeping yet when I woke up. He was on top of me the eyelids had been burned off his eyes and he had craved a smile into his cheeks. That’s all I saw feeling the knife stabbing me my eyes closed and I stopped breathing thinking that I was gonna die yet I didn’t cause. I woke up again noticing that I’m in a hospital bed recovering. So now I wander the streets searching for him even though I sometimes wear a mask to hide the scars on my face and a scarf to cover the scar that wraps around my neck. Now you know my story of what happened to me and my brother now if you excuse me I must go and continue my search. 3. Internet warrior need an icicle for that b*tt hurt? 4. Your mom’s calling you. It’s too short. You could have written a better story. Awful writing. You have zero ability to describe a scene. This was essentially you hinting at events that have no significance to the reader, as they’re not even relatively built up enough to matter. I’ve found more literary depth in a grocery list. 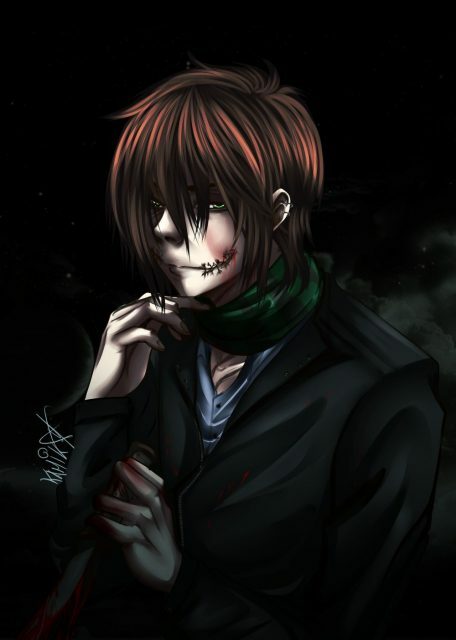 Um… This is basically just a lame and less detailed version of jeff the killer. I love the idea of showing the story through the brother’s perspective, but it would have been waaay more interesting if you made it seem like his perspective was different. You should have told what happened while he was taken away. Also i could just be stupid, but when it says he is searching for jeff, he never said why. Is he searching for him to finally be reunited again? To try and fix him? To join him? Or to kill him? Idk… Its not that i didnt like it. I just feel like anybody could have made this exact story. Its just not very NEW or DIFFERENT or UNPREDICTABLE ..but yeah good job coming up with the idea of a different perspective. 1/5 Another schlocky backstory written by Akira Spears adds nearly nothing new to the character of Liu from the already abominable ‘Jeff the Killer’. So I want jeff the killer to kill me how do i get a hold of him?